Providing you the best range of wooden blinds with effective & timely delivery. Wooden Blinds are made up of several long horizontal slats of bass wood, which are held together by cords that run through the blind slats. 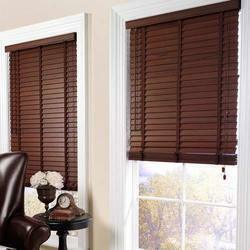 These window blinds can be maneuvered with either a manual or remote control system. These blinds are rotated from an open position, with slats spaced out, to a closed position where slats overlap and block out most of the light.